Boulder Mountain, part of Dixie National Forest is a massive green expanse of pine forests, meadows and lakes.7000 to 11,000 feet elevation. 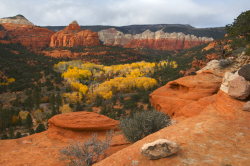 Hiking trails, numerous lakes known for abundant populations of brook trout, and views filled with blue sky and red canyon country reaching beyond the Colorado River. Boulder Mountain is within minutes of Torrey and a favorite spot for everyone. Its face of exposed red sandstone layers provides lovely red canyons on its lower slopes for hiking and exploring. 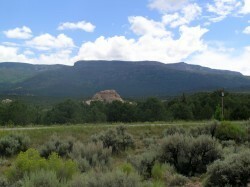 Higher, both steep and gentle slopes of open meadows with huge clusters of aspen and tall pines allow for pleasurable travel on foot, horseback, bicycle or ATV. Thousand Lake Mountain borders Fish Lake Mountain on the north and Capitol Reef National Park on the south. Torrey, within walking distance, lies at the base of Thousand Lake Mountain which rises from 7000 to 11,000 feet. 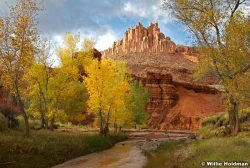 Capitol Reef National Park is a hiker's park with a myriad of trails for casual walking outings or serious hiking adventures. Hiking in Capitol Reef is pleasant all year and the vastness of Capitol Reef assures one of quiet and solitude. Visitors can stay in Torrey, eight miles from the visitor center, and spend the day in Capitol Reef. The history of the human presence in Capitol Reef is fascinating and everywhere, from the rock art lining the canyon walls to the orchards along the Fremont River.